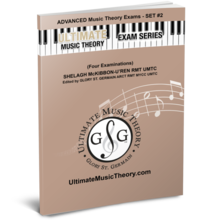 Advanced Music Theory Exams Set 2 Answer Book (Answers to all Four Exams in Set 2 Exam Workbook), Saves Time for Quick, Easy and Accurate Marking! Advanced Exam Set 2 Answers has been added successfully to your wishlist. 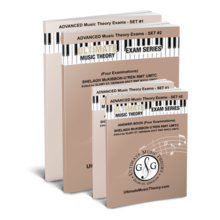 The Advanced Music Theory Exams Set 2 Answer Book is a "must have" teacher resource for instantly marking all Four Exams in the Advanced Music Theory Exams Set 2 Workbook. The UMT Exam Series is the ONLY exam series with matching Answer books! UMT Exams are specially designed to help students prepare for Nationally Recognized Music Theory Exams including the Royal Conservatory of Music Examinations. Advanced Exams Pack Set 1 & 2 has been added successfully to your wishlist. Advanced Exams Set 2 has been added successfully to your wishlist.